There's disappointing news on the horizon for fans of Miiverse, as Nintendo has announced plans to permanently shut down the exclusive social media service later this year. The closure will affect all games that had special Miiverse functionality, and users will no longer be able to access Miiverse from their Wii U or Nintendo 3DS systems. The service will be missed by Nintendo fans, as Miiverse was a well-loved feature that helped connect players across all walks of the Nintendo userbase. It provided access to a vibrant and sometimes very weird community, and though it may not have been terribly popular, it managed to do a lot of things right. In memory of its life and its accomplishments, we're taking a look back on what Miiverse was, what it did, and how players can keep its memory alive. At the time of its release, Miiverse was an unusual type of feature: it was a social media service that players were able to access from Wii U and Nintendo 3DS systems where they could share comments, post their in-game achievements, and draw out hand-written notes for other users. It was a bit like social functions common on home consoles today, but with one particular exception: the service was able to group posts together automatically based on related games or apps, meaning players could at any time instantly access global conversations about the Nintendo game they were playing from the console they were playing it on. 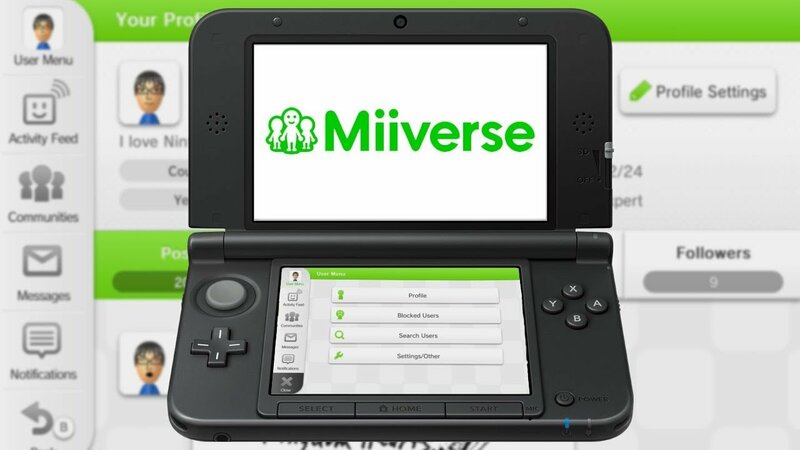 Along with user-customizable Miii avatars, Miiverse became a common commodity for Nintendo systems, and the service would eventually play host to a number of game-specific bonus features like as the ability to share in-game items or provide special stickers or emoticons that players could use in their messages. Nintendo would eventually add the option to tack screenshots onto comments within Miiverse, providing yet another form of classic one-up behavior that internet users both expect and demand, and later the ability for users to create Play Journals, which were like gameplay diary entries that could be linked to screenshot albums. Miiverse originally launched solely for the Wii U late in 2012, and would be given a web portal for PC and mobile access about five months later. The Nintendo 3DS gained its ability to access Miiverse in December of 2013, and the service itself saw its most recent update in December of 2015. When Nintendo launched the Nintendo Switch, however, Miiverse was not among the system's functions, and now that the service is shutting down, it likely never will be. When Will Miiverse Close? What Will Happen When It Shuts Down? According to a post made to the official Nintendo website, Miiverse will formally close up shop at 10 p.m. Pacific time on November 7. After that time, users will no longer be able to access the service from any device, including PCs, mobile devices, Wii U consoles, and Nintendo 3DS and 2DS systems. In addition, any games that have special support for Miiverse will no longer be able to access those specific features or functions. For all of the players that have shared heartfelt exchanges and hilarious stories through Miiverse, Nintendo has thankfully provided a way to back up all of a user's Miiverse-based posts. Do note that this function is restricted to users with a valid Nintendo Network ID, is only provided by request, and it may take quite some time for compiled backups to arrive. To learn more, check out our guide on how to back up Miiverse posts, and be sure to place the backup request before November 7. It's sad that Miiverse is gone, but players will still be able to enjoy Nintendo's most popular games. To discover some of their greatest hits, check out our list of the Best Nintendo 3DS Games as well as our list of the Best Nintendo Switch Games.